Patriots – Texans Week 1, Key Match Ups, Who Has the Razor’s Edge? The New England Patriots will meet the Houston Texans at Gillette Stadium in Foxboro. Kickoff is scheduled for Sunday afternoon at 1:00 p.m. This week’s game will be televised by CBS and can be seen locally on WBZ-TV Channel 4 in Boston. Their top announcing crew will cover the game with Jim Nance, who will handle play-by-play duties with Tony Romo as the color analyst. Tracy Wolfson will work the sidelines. The game will also be aired on the Patriots flagship radio station 98.5 The Sports Hub with Bob Socci and Scott Zolak on the call, produced by Marc Capello. The Texans (4-12 in 2017) are healthy and looking to get back in the playoffs. They have a lot of their starters returning healthy after a disastrous 2017. Deshaun Watson was off to an electric start of his career before being placed on IR. They are looking to win in New England for the first time. We here at PatsFans.com are continuing our “Razor’s Edge” column in 2018 to give some quick analysis on some of the key matchups of the game and what you can look for in how the game plays out. The Patriots and Texans will be meeting for just the 11th time as Houston entered the league in the 2002 season. The Patriots hold a 9-1 advantage in these contests while holding a perfect 5-0 advantage at home, including a pair of playoff wins over the Texans in Gillette. The Patriots needed a vintage 4th quarter Tom Brady drive to beat Houston 36-33 last year in Week 3. 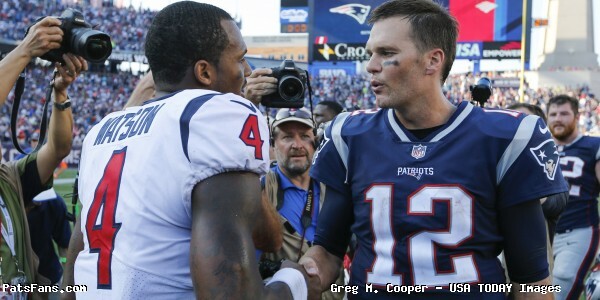 Deshaun Watson was outstanding under center for Houston, passing for 301 yards and a pair of scores and the defense sacked Tom Brady five times. 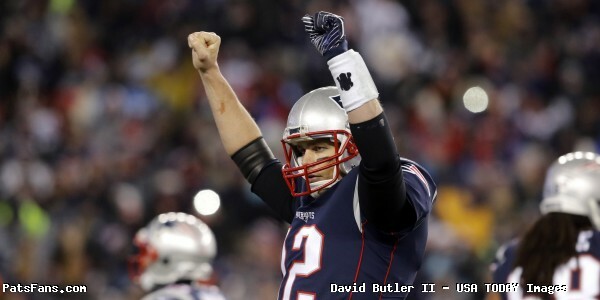 Despite that, Brady passed for 378 yards and five touchdowns in the huge comeback win. The Pats defense didn’t have a great day but produced two interceptions of Watson. The Patriots running game once again made big changes during the offseason. Dion Lewis, Mike Gillislee and Brandon Bolden are gone. Jeremy Hill is in with James White. Sony Michel and Rex Burkhead have knee injuries and while they’ve been practicing again, it is probably doubtful both plays this week. The Texans front seven is very good and despite the myriad of injuries they suffered last season, they were very good (13th) against the run. The Patriots could only muster 59 yards a year ago. Can Hill and White muster more than that? We say no this week. The Patriots passing game is thin at WR with only four on the roster plus Matthew Slater. But here’s where the chess match gets interesting. The Texans have a ridiculous plethora of pass rushers, J.J. Watt, Whitney Merciless, Jadeveon Clowney as well as promising rookie Duke Ejiofor and sacked Brady five times last year. But Brady torched them across the middle of the field to the tune of 378 yards a 5 TDs. Look for lots of two RB, and two TE sets to offset the lack of WRs. James White and Rob Gronkowski will be moved around a lot in motion, splitting out wide to get favorable matchups. Houston has two new safeties, Tyrann Mathieu (Honey Badger) and converted corner Kareem Jackson who are 5’9 and 5’10 respectively. 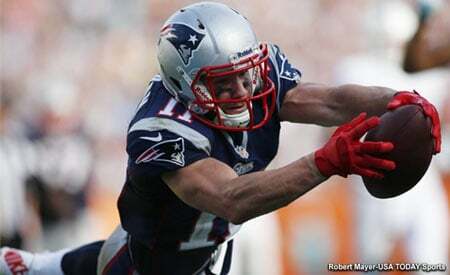 Look for Brady to test them in coverage against the much bigger Gronkowski. Burkhead, if he’s available is the “X-Factor” for the Patriots passing game. Lamar Miller remains the workhorse for the Texans running game. He lost weight in the offseason to get back some of the explosiveness that was missing a year ago. However, second-year RB D’Onta Foreman is on PUP for the Achilles he suffered last year. Watson burned the Patriots last year with his ability to scramble. After barely playing in the preseason, will he be given the green light to do it again? The Patriots made some changes up front from last year, bringing in Danny Shelton who should anchor down the middle, in a rotation with Lawrence Guy, and Malcom Brown. Dont’a Hightower returns from his season-ending injury and should really help in the run defense which was porous last year. Houston has totally revamped their offensive line, which is still a question mark at this point. Watson had the Texans offense exploding once he took over at QB last season, averaging nearly 40 points per game. He has one of the best WRs in the game in DeAndre Hopkins who caught 96 passes a year ago, most of the season with awful QB play. Will Fuller has been hurt but is supposed to play this week and he gives Watson a pair of extremely talented wide receivers. Tight End Ryan Griffin could be the “X-Factor” this week. Last year the Patriots did a terrible job of containing Watson in the pocket, and if he gets out to the edge where he can run or throw, the defense will get gashed again. But unlike last year, when they went to a smaller, safety-centric look, I believe, they’ll go bigger here and look to anchor the edges and push the pocket from inside. The edge rushers, led by newcomer Adrian Clayborn, Trey Flowers, Deatrich Wise, Derek Rivers, and Keionta Davis will have their hands full. Can they bring pressure without losing containment and force Watson to get rid of the ball early? We’ll see. The Patriots’ Stephen Gostkowski and Ryan Allen are back and very solid. Allen, in particular, had an outstanding summer after being pushed in training camp by some competition. The Patriots coverage units are always solid although they’ll be missing two of their stalwarts from the past few years in Jordan Richards and Brandon Bolden. But they get back Nate Ebner and Matthew Slater and have added one of the most dynamic kick returners in the league in Cordarrelle Patterson. Who return punts at this juncture remains a mystery. The Texans special teams were just awful a year ago, especially their kickoff coverage. But they brought in former Patriots ST coach Brad Seely to right the ship. Long-time punter Shane Lechler was released, beaten out by rookie Trevor Daniel. Kicker Ka’imi Fairbairn has a very strong but inaccurate at times leg. The first game of the season is always the most difficult to predict. Because the element of the unknown is still out there. The starters for the offenses and a bit on defense haven’t played an entire game since last season and there are always new moving parts on both teams. The key for the Texans is to get Watt untracked and early. If he’s his normal explosive self, the Texans’ Romeo Crennel will move him around and disrupt everything. A healthy Watt just makes Clowney, who is becoming an elite edge rusher and Mercilus, that much better rushing the QB. The Texans inside backers Benardrick McKinney and Zach Cunningham, who is a sideline to sideline player will play key roles for them this week, trying to take away Gronkowski’s domain inside. The Patriots will try to move their backs and tight ends around to create mismatches for Tom Brady to exploit. James White will probably be the most targeted member of the offense on Sunday. How well the offensive line holds up is always a key for the Patriots and especially against this excellent Houston front seven. Defensively for New England, they try to match up against the Texans top two WRs but how well they do against the backs and tight ends will have a lot to say how this game goes. Containment of Watson in the pocket is key for Brian Flores group. 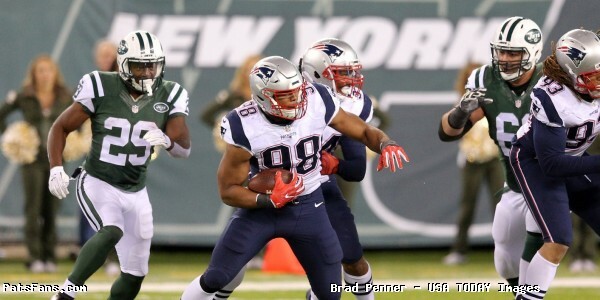 This entry was posted in 2018 Patriots Regular Season, NFL Commentary, NFL News, Patriots Commentary, Patriots News and tagged 2018 Patriots Schedule, 2018 Patriots season, Adrian Clayborn, Benardrick McKinney, Bill Belichick, Bill O'Brien, Chris Hogan, Cordarrelle Patterson, DeAndre Hopkins, Deatrich Wise, Derek Rivers, Deshaun Watson, Houston Texans, Jadeveon Clowney, James White, JJ Watt, Keionta Davis, Lamar Miller, New England Patriots, Phillip Dorsett, Rex Burkhead, Rob Gronkowski, Romeo Crennel, Tom Brady, Trey Flowers, Whitney Mercilus on September 6, 2018 by Steve Balestrieri. Every so often, New England Patriots head coach Bill Belichick will break his “all business” character, whether its joking about “SnapFace” or what he does during summer vacation, even one of the most serious members of the National Football league has had his share of quotes that have caught many reporting on him off guard. On Wednesday while speaking to the media at The Greenbrier, another such “did he just say that?” instance occurred when Belichick was discussing his lengthy relationship with Texans defensive coordinator Romeo Crennel. Belichick is running through his history with Crennel: "We worked with the Patriots together, then another team, then back to the Patriots." “Another team” of course is actually the New York Jets, where Belichick spent three seasons (1997-1999) as Assistant Head Coach and Defensive Coordinator under Bill Parcells, to go along with one day as Head Coach during his infamous surprise resignation in 1999. Crennel worked under Belichick as his defensive line coach during that timeframe. The abrupt resignation and hiring with the Patriots triggered a tampering charge by the NFL that forced the team to send the Jets a first round pick in exchange for Belichick. Throughout the Belichick tenure in New England, the relationship with the Jets has continued to be rocky, reaching a new high after Eric Mangini kicked off Spygate following a report to the league office about the Patriots videotaping methods. While the majority of Belichick press conferences provide little color or detail, this seemingly intentional removal of the Jets period of his NFL career during this presser is about the closest one will get to understanding how the coach really feels about how the way things ended there and how his resentment towards the franchise still remains with him after all these years. This entry was posted in 2017 Patriots PreSeason, 2017 Patriots Training Camp, Patriots Commentary, Patriots News and tagged Bill Belichick, Eric Mangini, Romeo Crennel on August 16, 2017 by Robert Alvarez. Over the course of Bill Belichick’s tenure in New England, it’s a common public perception thatt he future Hall of Fame head coach is often times viewed as a guy who’s “always serious” with a “business first” attitude, especially during the grind of training camp. However this week the Patriots have been participating in joint practices with the Houston Texans in a far more relaxed setting at The Greenbrier luxury resort in rural West Virgina and with it came some rare smiles from the coach alongside his girlfriend Linda Holliday. Belichick and Holliday also posed for a happy group photo with former Major League Baseball Manager Tony LaRussa, a close friend of the Belichick family. As with other recent meetings with the Texans, the matchup also provided the Patriots with a reunion of many former players and coaches that previously worked in New England. Some ex Patriots include Head Coach Bill O’Brien, Assistant Head Coach Romeo Crennel, Defensive Coordinator Mike Vrabel, Special Teams Coordinator Larry Izzo, and Special Teams Assistant Wes Welker. This entry was posted in 2017 Patriots Training Camp, Patriots Photos and tagged Bill Belichick, Bill O'Brien, Larry Izzo, Mike Vrabel, Romeo Crennel, Wes Welker on August 16, 2017 by Robert Alvarez. The Patriots take the field in the Divisional Playoff game against the Houston Texans on Saturday night in Foxboro. Kickoff is slated for 8:15 p.m. and the weather is supposed to get cold again with temperatures in low-to-mid 20s at the start of the game. The Pats worked hard this season to earn home-field advantage in the playoffs and the road to the Super Bowl in the AFC goes thru Gillette. They’re taking a Houston team, basically playing with house money. Until the Raiders lost two QBs, nobody gave them much of a chance of reaching this round and few of the experts covering the NFL give them much of a shot this week. That’s why they play the games on the field. I would expect Bill O’Brien to be very aggressive this week. 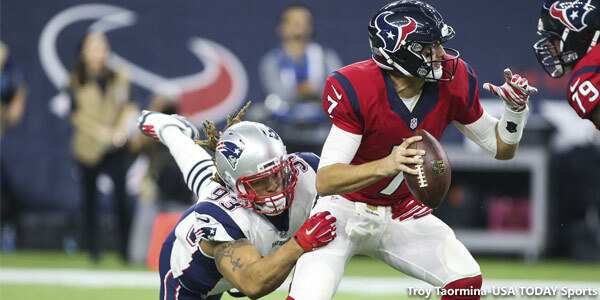 Look for the Texans to empty the playbook and throw as much at the Patriots as they can. 4th and 1 at anywhere near mid-field, they’ll go for it….at least they should. With a win on Saturday, the Patriots will set another record, passing the Oakland Raiders and be playing in their sixth straight conference championship. Nothing says sustained excellence better than that. So, with that in mind…. Quarterback Tom Brady: The Patriots QB had a tremendous season after coming off his league-imposed “vacation” for Weeks 1-4. Brady continues to amaze, even at the ripe old age of 39. In truth, he’s playing better now than he was at 29. In 2016, he set a new NFL record for touchdown to interception ratio, throwing 28 TDs to just 2 INTs. He’ll also add to his record just by taking the field on Saturday and play in his 32nd postseason game, the equivalent of two NFL seasons. He’ll be facing a Texans defense that knows the Patriots well. DC Romeo Crennel held the same position here for the first three Super Bowls of the Patriots era. Linebacker coach Mike Vrabel played an integral part of those teams. Houston head coach Bill O’Brien was the offensive coordinator here. So, Houston knows what the Pats like to do, especially in certain downs and situations. Crennel will try to change his pre-snap looks to something different once the ball is hiked to slow Brady’s thought process down and give his pass rush that extra half-second to get home. Of course, Brady knows this too, he’ll be ready for the shifting line just before the snap, to the secondary members shifting at the snap. It all will come down to execution. Brady will have all his WRs at his disposal this week. The team misses Rob Gronkowski, but they’ve adapted to absence the best that they can at this point. Brady will lean on his buddy Julian Edelman heavily, especially early in this one. Cornerback Logan Ryan: The Pats corner has traditionally been tasked with covering the Texans best wide receiver and their most talented offensive player, DeAndre Hopkins in past meetings. He’ll probably get the nod there again. In two meetings between the teams in 2015 and in Week 3 this season, Ryan covered Hopkins and allowed only 5 catches on 11 targets for 96 yards with two passes defended. Ryan began the year on the right, #2 CB opposite Malcolm Butler. But the team leaned on the 25-year old’s versatility and shifted him inside to the slot. That allowed the defense to move the bigger Eric Rowe outside with Butler. The results have been much better playing from the entire secondary. Ryan leads the team with 92 tackles and is solid in run support as well as three QB hits and a sack blitzing from the slot. He has logged 11 passes defended and a pair of interceptions on the year. Look for Ryan to be tasked with covering Hopkins again with some over the top help and trying to bracket the Texans top receiver. He’s elevated his play down the stretch, allowing just around 40 percent of passes thrown his way to being caught. Wide Receiver Julian Edelman: Edelman entered this season as a bit of question mark, at least physically. After his foot surgery in 2015, he re-injured it in training camp during a joint practice and things were looking a bit dicey. But after a somewhat slow start, Edelman answered the bell for all 16 games and turned in an excellent 98 catch, 1106-yard performance in 2016. Now he’s healthy and leads the deepest group of wide receivers the Patriots have had in the Brady/Belichick era. He’ll be playing in his 13th playoff game of his career against the Texans and just needs two catches to pass Wes Welker for most post-season catches (69, you know what that means Gronk?) in Patriots history. But for Edelman, he’s like Brady and the rest of the Patriots under Belichick. Personal stats mean nothing, the only thing that matters is getting the win. Look for him and Brady to try to get the chains moving quickly on Saturday night. Houston has a good pass defense that allowed just 201 yards per game during the regular season. The Patriots will attempt to use the quickness of Edelman to get those short, crossing routes open and create some space for the other receivers to work in. Defensive End Trey Flowers: The Patriots defensive end has had a breakout season in 2016. After having an impressive training camp last year in his rookie campaign, he suffered some different injuries that caused him to play in just a single game. But the soft-spoken native of Alabama has really stepped up his game in 2016. The Patriots under Belichick and Matt Patricia, like for their defensive players to be versatile and Flowers has fit the bill perfectly. He’s played defensive end and has frequently been pushed inside on passing downs as a smaller, interior pass rusher. He’s been just as good at setting the edge in the running game as rushing the QB from the edge and push the pocket from the inside. Frequently lauded by the coaches for his solid play, he’s been playfully nicknamed “Technique” by his teammates. But since the midway point of the season, Flowers has logged seven sacks, most on the team. He’ll go against Duane Brown for part of this upcoming game. The Texans LT missed the first contest and he spearheaded an effort against Oakland last week that kept the Raiders pass rush from sacking Brock Osweiler once. Flowers will be looking to get into the pocket and disrupt the timing of the passing game. Patricia will move him around both inside and out but look for the 2nd year pro playing in his first playoff game to be a factor. Offensive Tackle Nate Solder: Much of the talk during last week’s Wild Card game centered around the uber talented Houston DE/LB Jadaveon Clowney. Clowney is an athletic freak who had a tremendous impact on the game, blowing plays up in the backfield, creating pressure and intercepting a screen pass in the flat. Looking to neutralize him will be Patriots LT Nate Solder. Solder was limited to just four games in 2015 before being placed on IR. He’s returned and has played outstanding this season. But with the unexpected emergence of RT Marcus Cannon, little has been mentioned about Solder’s play. He hasn’t allowed a sack since Week 10. This promises to be a great matchup. Clowney was limited by injuries early in his career and came on at the end of 2015. Now fully healthy, he’s been the force that many foresaw for him when he was the #1 pick in the draft. Solder will have his hands full with the talented pass rusher and if need be, the Patriots will double him up. But look for the coaches to match them one-on-one initially. Who Do You Got This Weekend: With the Divisional Round of the 2016 NFL Playoffs here, it usually means some of the best football of the season. These games are normally some of the best to watch and this week’s slate has some intriguing matchups. Last week, I went 3-1, whiffing on the Giants and their own version of the Love Boat cruise. New England over Houston- see our breakdown here. Atlanta over Seattle- Matt Ryan finds holes in the LOB without Earl Thomas. Seattle just hasn’t been that good on the road this season, with the exception being their game in NE. Kansas City over Pittsburgh- This will be one of those weird games where either the Chiefs win a close one or get blown out. I see the Chiefs holding serve over an explosive Pittsburgh offense with a late field goal to win the game. The home field advantage here, being in Arrowhead is the difference. But the “X-Factor” is LaVeon Bell for the Steelers. KC didn’t have a very good rush defense, and Bell can turn the game in a hurry. Dallas over Green Bay: Ditto for home field. The Cowboys offensive line and their running game will be the difference at home as they control the clock and limit how much Aaron Rodgers and the Pack’s offense has the ball. Word to the wise for Dallas. You’ve ridden a rookie QB all the way to home-field advantage for the playoffs. Let him do the things he’s done all season. Don’t be like the OC for Alabama and get all conservative with Dak Prescott now. Stay tuned to PatsFans.com as well have up-to-the-minute breaking news as well as post-game analysis. This entry was posted in NFL Commentary, Patriots Commentary and tagged 2016 NFL playoffs, 2016 NFL Season, 2016 Patriots playoffs, 2016 Patriots season, Bill Belichick, Bill O'Brien, Brock Osweiler, Chris Hogan, Danny Amendola, DeAndre Hopkins, Dion Lewis, Dont'a Hightower, Houston Texans, Jabaal Sheard, Jadaveon Clowney, Julian Edelman, LaGarrette Blount, Malcolm Butler, Martellus Bennett, Mike Vrabel, New England Patriots, NFL, Patriots, Patriots edge rushers, Rob Gronkowski, Romeo Crennel, Tom Brady, Trey Flowers on January 13, 2017 by Steve Balestrieri. The New England Patriots will play the Houston Texans in the Divisional Round of the 2016 NFL Playoffs from Gillette Stadium in Foxboro. Kickoff is scheduled for Saturday night at 8:15 p.m. This week’s game will be televised by CBS and can be seen locally on WBZ-TV Channel 4 in Boston. Jim Nantz will handle play-by-play duties with Phil Simms as the color analyst. Tracy Wolfson will work the sidelines. The game will also be aired on the Patriots flagship radio station 98.5 The Sports Hub with Bob Socci and Scott Zolak on the call, produced by Marc Capello. The Texans (10-7) beat the Oakland Raiders 27-14 in the Wild Card game in Houston. Brock Osweiler threw for a touchdown and ran for another and the defense led by Jadeveon Clowney shut down the Raiders offense, holding them to just 203 yards and forced three turnovers. We here at PatsFans.com are continuing our “Razor’s Edge” column in 2016 to give some quick analysis on some of the key matchups of the game and what you can look for in how the game plays out. The Patriots and Texans will be meeting for just the 9th time as Houston entered the league in the 2002 season. The Patriots hold a 7-1 advantage in these contests while holding a perfect 4-0 advantage at home, including a 41-28 playoff win over the Texans in 2012. The Patriots dominated the Texans 27-0 in Week 3 of the 2016 season with Jacoby Brissett, the Pats rookie 3rd string QB at the helm. The defense shut down and shut out the Texans that night forcing three turnovers while rushing for 185 yards. This entry was posted in NFL Commentary, Patriots Commentary and tagged 2016 NFL playoffs, 2016 Patriots playoffs, 2016 Patriots season, Benardrick McKinney, Bill O'Brien, Brock Osweiler, C.J. Fiedorowicz, Chris Hogan, Danny Amendola, DeAndre Hopkins, Dion Lewis, Dont'a Hightower, Houston Texans, Jabaal Sheard, Jadaveon Clowney, Jimmy Garoppolo, Julian Edelman, LaGarrette Blount, Lamar Miller, Malcolm Butler, Martellus Bennett, New England Patriots, NFL, Patriots, Rob Gronkowski, Romeo Crennel, Ryan Griffin, Tom Brady, Trey Flowers, Whitney Mercilus, Will Fuller on January 12, 2017 by Steve Balestrieri. The Patriots return to Foxboro just four days after their home opening win over Miami. They’ll be taking on the 2-0 Houston Texans who have been impressive the first two weeks of the season. The two teams met a year ago with the Patriots rolling to an easy win but this Houston team is vastly different than the one that the Patriots had their way with. The teams will meet on Thursday Night Football on the NFL Network at 8:30 p.m. With Jimmy Garoppolo being hurt in the Miami game, the Texns will face rookie QB Jacoby Brissett in his first NFL start. Osweiler was an easy choice: When the Texans lost their playoff game to Kansas City 30-0 a year ago, it was obvious that some wholesale changes needed to be made with the offense and they started at the most pressing, at quarterback. Houston waved goodbye to former Patriots Brian Hoyer and signed free agent Brock Osweiler. Osweiler had an extended cameo of his services when the Broncos sat down Peyton Manning during their Super Bowl run a year ago. When John Elway balked at giving the youngster a new contract this offseason when they tried to lure Manning back for a final season, Osweiler bolted for the Texans signing a 4-year, $72 million-dollar contract. He has a ready-made excellent QB coach in Bill O’Brien who will be hard but fair with him. O’Brien will develop his talents to the utmost. So far, the big QB has played well. He’s had some hiccups with turnovers, he’s thrown three so far, including two against the Chiefs on Sunday, but O’Brien isn’t worried, as mistakes will happen while learning a new system. And the Texans is much like the Patriots, very different than what they ran in Denver with Gary Kubiak. But Osweiler is a big upgrade at the position for Houston. They’ve added the pieces around him to make the offense much more difficult to stop in the coming weeks. Miller Fuller Add Big Pieces to the Offense: The Texans made a couple of splashes in free agency, bringing Osweiller in and also bringing in running back Lamar Miller from the Miami Dolphins this spring. With Arian Foster on IR last year, the Texans were in need of an upgrade there. Foster ended up with the Dolphins, signing there this summer so the teams essentially traded backs. Miller was a great pickup for Houston, he was very underused in Miami and is a good runner and pass receiver and at just 25 years old is an upgrade over Foster at this time of his career. He’s been the workhorse for Houston carrying the ball 53 times for 189 yards on the season adding six receptions for 26 yards. He was stopped for three quarters by the Chiefs but O’Brien stuck with the running game and Miller was able to grind out yards and kill the clock down the stretch. The Texans drafted the speedster Will Fuller from Notre Dame in this year’s NFL Draft with the 21st pick in the first round. It was obvious they needed a threat opposite DeAndre Hopkins and they let Nate Washington and Cecil Shorts go. Fuller, a 6’0, 175-pound wide receiver has excellent speed and thus far has proven to be a perfect complement to Hopkins. Thru the first two games, Fuller has nine catches for 211 yards (23.4 yard average), and a touchdown. He’s the first rookie since DeSean Jackson in 2008 to have two 100 yard receiving games in his first two NFL games. He and Hopkins are a dynamic duo and facing a Patriots secondary that did not have a good game on Sunday. Watt is Still the Driving Force in a Good Texans Defense: Houston’s J.J. Watt seems to be completely recovered from offseason back surgery and he’s the guy to watch for a Houston defense that hasn’t allowed a touchdown in six quarters. Watt missed all of July and nearly all of August’s workouts and is admittedly still working his way back into football shape. He told the media on Sunday, that in the opener he knocked off some rust and that he just added to that this week. Watt’s “a little bit better” totals on Sunday? Five tackles, 1.5 sacks and a fumble recovery. Houston held Kansas City out of the end zone on Sunday and sack QB Alex Smith four times in the 19-12 victory. Now on the short week, Watt and Co. will be facing the Patriots rookie QB in Jacoby Brissett on Thursday night. If Texans Seem to be Familiar, They Are: There are a lot of Patriots connections with the Houston Texans and head coach Bill O’Brien is building himself a team on a solid foundation of New England talent. George Godsey was the Patriots tight ends coach and was here from 2011-2013. Linebacker coach Mike Vrabel is one of the hottest coaches in terms of getting top job offers. He was a standout member of the Patriots during the first three Super Bowl winning teams as a linebacker and goal line tight end. Special teams coordinator Larry Izzo was a standout STs player on the Patriots between 2001-2008. And of course the biggest Texan of them all is Vince Wilfork. The big man spent 12 seasons with the Patriots. Wilfork played in 158 games and tallied 517 tackles, 16.0 sacks, three interceptions for 48 yards, 35 quarterback hits, 28 tackles for loss, 12 fumble returns, four forced fumbles and 26 passes defensed. When looking at the organization that O’Brien is building around him in Texas, it is easy to see where the emphasis on creating a winning atmosphere is coming from. Special Teams Coverage Units Still Have Questions: One of the other weaknesses on the Texans a year ago was on their Special Teams. In the playoff loss to Kansas City they gave up an opening kickoff return for a touchdown which set up a frustrating day for the Texans as they lost badly. That prompted the hiring of Izzo as the STs coordinator. During the preseason, the Houston coverage units were pretty solid but against the Chiefs again, breakdowns in coverage again reared their ugly head. KC’s electric returner, rookie Tyreek Hill gave the Texans fits on Sunday. He averaged 15.8 yards per punt return, 27.7 yards per kickoff return, and took a kick back for a TD that was brought back on a very questionable holding call. Is this just an anomaly due to a rookie returner that the team didn’t have enough tape on? Or is this an area that could be possibly exploited on Thursday. This will be an area that will bear watching. Check back with us later in the week as we’ll break down the key matchups for the game right here on PatsFans.com. This entry was posted in Patriots Commentary, Patriots News and tagged 2016 NFL Season, 2016 Patriots season, Bill Belichick, Bill O'Brien, Brock Osweiler, DeAndre Hopkins, George Godsey, Houston Texans, Jabaal Sheard, Jimmy Garoppolo, JJ Watt, Julian Edelman, LaGarrette Blount, Lamar Miller, Larry Izzo, Malcolm Butler, Mike Vrabel, New England Patriots, NFL, Patriots, Patriots edge rushers, Rob Gronkowski, Rob Ninkovich, Romeo Crennel, Tom Brady, Trey Flowers, Vince Wilfork, Will Fuller on September 20, 2016 by Steve Balestrieri. The Patriots are in unfamiliar territory having lost two games in a row and with those back-to-back losses have dropped to #3 seed in the AFC playoff race. Now they look to get back on the winning track against a resurgent Houston team on Sunday Night Football. The Texans, like the Eagles last week are very much in the hunt for not only a Wild Card berth but their division lead despite a 6-6 record. They had their four-game winning streak broken last week with a 30-21 loss against the Bills and will be looking to also get back on the winning track. We already broke down this game with our Key matchups breaking down the offensive, defensive and special team’s units for this week. James White: The Patriots have struggled on 3rd downs since the injuries to Dion Lewis, Julian Edelman, Danny Amendola and Rob Gronkowski have decimated the receivers for Tom Brady. From humming along at about 50 percent, the past few games the team is struggling at a 15 for 58 conversion rate, which is nearly half of what they were doing earlier in the year. During their recent four-game winning streak, the Texans were allowing only 21.2 percent of third downs while racking up 16 sacks. This is going to be a key area to monitor on Sunday night. With Amendola back, albeit not at 100 percent, Brady has to go back to what the Patriots do best, which is to move the chains and not take so many deep shots down the field with players that aren’t suited for that role. 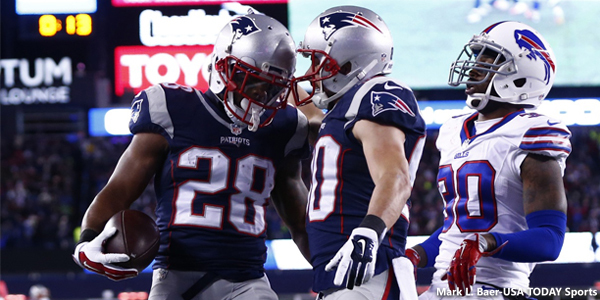 Running back James White is a player that can help them get back closer to that percentage and keeping drives alive. White has proven to be a good blocker in pass protection and one way to slow down opponents’ pass rushes is to hit them with some screen passes to the running backs. In the second half of the Eagles game, the team used him much more. They should take some of the shackles off of him and give him plenty of work in the short passing game and get back to what they do best. Key Stat: White caught 10 passes for 115 yards on Sunday with a touchdown. If the team starts using him more, it will take some of the burden off of Brady. Brandon LaFell: LaFell is having a rough 2015 after a particularly strong finish to last season’s Super Bowl run. After missing all of the spring and summer workouts, he’s struggled to get back in sync with Brady and drops have plagued him since his return. Without Edelman and Gronkowski, the onus was being placed on both him and Scott Chandler and thus far he hasn’t answered the bell. Last week he caught just four passes for 27 yards against the Eagles and drops and not properly running of routes was particularly costly. LaFell has had just one game in 2015 with more than four catches; he’s not a #1 type receiver but he’s going to have to step up much more in the coming weeks. One thing they can do is get to him running some slants that can take advantage of his size. Those have been there for the taking and cut back on the deep routes that they’re asking him to run all too frequently. Getting him more involved will not only help in the short term but make the offense that much tougher to stop once Edelman and Gronkowski do make their return to the lineup. Facing a good defense in the Texans on primetime is a great place to start. Key Stat: LaFell has been targeted 56 times in 2015 without scoring a touchdown. That is the most in the NFL. Chandler Jones: The Patriots talented 4th year defensive end is having one of the best years in his career and is currently 3rd in the league with 10.5 sacks. His improved play against the run this season has been one of his biggest jumps in 2015. This week however, the Texans running game hasn’t been overly effective since Arian Foster went down with a season-ending injury. They’ve been attacking the field with the passing game and it is here where Jones will have to step up this week. Jones and fellow edge players Rob Ninkovich and Jabaal Sheard will have to put some pressure on Brian Hoyer this week to take away those deep shots to DeAndre Hopkins. Consistent QB pressure is the key this week and Jones will be looked at to lead the way this week. His next sack will tie his career high with 11.5. Key Stat: The Patriots are one of only four teams without a defensive or special teams touchdown in 2015. With the offense struggling the past few games, this would be the time for Jones to turn that stat around. DeAndre Hopkins: The Texans talented wide receiver is rapidly becoming one of the best in the league at his position. The 6’1, 218 lb receiver accounts for 27 percent of the Texans offensive output in 2015. They have faith in him even when he’s blanket covered that he’ll be able to go up in contested areas and come down with passes. He’s caught 86 passes for 1169 yards and 10 touchdowns this season and has outstanding speed, catch radius and hands. He’s Hoyer’s most frequent target in the passing game and has more than double the receptions of their next receiver (Cecil ShortsIII – 40). Whether the Patriots use Malcolm Butler, who they’ve used to cover many of the top receivers in the league or Logan Ryan, they’ll probably bracket Hopkins with some over the top safety help. They won’t shut him down…no one has. But the plan has to be from limiting him from having a huge game….it will be a tough task. J.J. Watt: The Texans uber-talented defensive lineman has been on a roll since the Texans started their resurgence. He leads the NFL with 13.5 sacks and has had two seasons with 20 or more. The Texans like to move him around a lot and find a spot where he can take advantage with most of his opportunities. He must be liking his chances this week of adding to his total facing a Patriots offensive line that has been banged up and in flux all season long. Watt broke his hand in practice this week, and missed practice both Thursday and Friday but plans on playing Sunday night. How much his hand will affect his game will be an area to watch. Key stat: In the last three games against New England, Watt hasn’t been much of a factor, albeit against a healthy offensive line. His stat line in those three games: 8 tackles, one forced fumble and .5 sack, far below his normal production. Limiting his effectiveness will go a long way in gaining an edge this week. Brian Hoyer: The Texans starting QB served as Tom Brady’s backup for the first three years of his career and he’s used those formative seasons as a stepping stone to the success he’s having in 2015. Bill O’Brien pulled the plug on him too early in the first game of the season and the team went to Ryan Mallett who is no longer with the club. Since Hoyer’s return to the starting lineup, he’s playing much better and has got the offense under control. They’re not a juggernaut but his play has been steady. For the season Hoyer has completed 188 of 307 for 61.2 percent, good for 2202 yards with 18 touchdowns and just six interceptions for a passer rating of 94.4. Key Stat: Hoyer has taken great care of the ball inside the red zone in 2015. His RZ numbers include 13 touchdowns and zero interceptions. When they get inside the 20 yard line, he’s not making any mistakes that would take away a chance at points. This entry was posted in Patriots News and tagged 2015 NFL Season, 2015 Patriots Season, Bill Belichick, Bill O'Brien, Brandon LaFell, Brian Hoyer, Cecil Shorts III, Chandler Jones, Danny Amendola, DeAndre Hopkins, Houston Texans, J.J. Watt, Jabaal Sheard, James White, Julian Edelman, LaGarrette Blount, New England Patriots, NFL, Patriots, Patriots edge rushers, picks, predictions, Rob Gronkowski, Rob Ninkovich, Romeo Crennel, Social Media, Tom Brady on December 12, 2015 by Steve Balestrieri. Patriots – Texans, Key Matchups, Who Has the Razor’s Edge? The New England Patriots head out on the road to face the Houston Texans on Sunday Night Football. The game was originally slated for 4:25 p.m. but was flexed by the league into the primetime slot. The Patriots (10-2) lost to the Philadelphia Eagles 35-28 at home for their second consecutive loss, the first time that’s happened since 2012. Tom Brady threw two picks including a 99-yard pick six as the special teams units allowed a punt to blocked and returned for a touchdown seconds before the first half ended and as well as an 83-yard punt return for a touchdown by Darren Sproles. The Texans (6-6) lost to the Buffalo Bills 30-21 breaking a four-game winning streak as the Bills ran for 182 yards. Houston is still in the thick of the race for either a Wild Card or the AFC South Divisional Crown. The Patriots and Texans will meet for only the seventh time overall as Houston just entered the league 14 years ago. The Patriots hold a 5-1 overall edge including a playoff game in January 2013 and the last three in a row. This will be the fourth meeting between the teams in Houston where the Patriots hold a 2-1 advantage. The last meeting between the teams was in November of 2013 with the Patriots taking a 34-31 win in Houston. This entry was posted in Patriots Commentary, Patriots News and tagged 2015 NFL Season, Bill Belichick, Bill O'Brien, Brandon LaFell, Brian Hoyer, Chandler Jones, Danny Amendola, DeAndre Hopkins, George Godsey, Houston Texans, J.J. Watt, Jabaal Sheard, Julian Edelman, LaGarrette Blount, Malcolm Butler, Mike Vrabel, New England Patriots, NFL, Patriots, Patriots edge rushers, predictions, Rob Gronkowski, Rob Ninkovich, Romeo Crennel, Tom Brady, Vince Wilfork on December 10, 2015 by Steve Balestrieri. The Patriots return to the national stage with a Sunday Night Football matchup against the Houston Texans. The game will be played at NRG Stadium at 8:30 p.m. The Texans (6-6), lost on Sunday 30-21 to the Buffalo Bills. Tyrod Taylor hit TE Charles Clay for a 40-yard touchdown pass with 1:53 left for the winning score. The loss snapped a four-game winning streak for the Texans. Brian Hoyer completed 26-43 passes for 293 yards with three touchdowns and an interception in the loss. The Patriots (10-2), lost for the second straight week 35-28 to the Philadelphia Eagles. 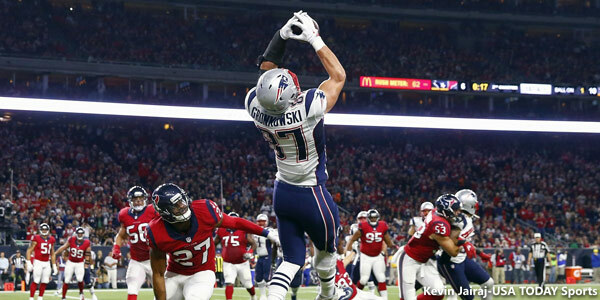 The Patriots gave up a blocked punt, an 83-yard punt return as well as a 99-yard interception return for touchdowns. 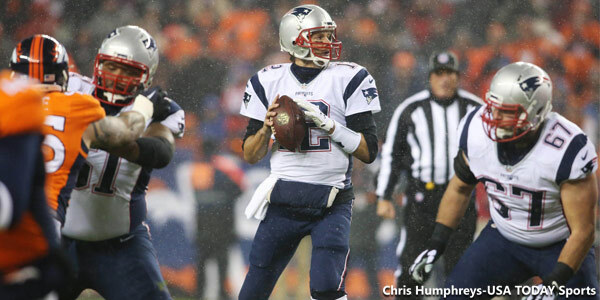 Tom Brady had three touchdowns but two very costly interceptions in the game. The game will be televised by NBC with their top announcing crew of Al Michaels, Cris Collinsworth and Michele Tafoya. It will also be carried by the Patriots flagship radio station 98.5 FM the SportsHub with Bob Socci and Scott Zolak. Do These Texans Look Familiar? They Should: Head coach Bill O’Brien was the offensive coordinator here for the Patriots and has adopted much of the same playbook. Texans defensive coordinator Romeo Crennel held the similar post here and was the architect along with Belichick of those excellent defenses of the early 2000s. Texans LB coach Mike Vrabel was a standout player for the Patriots during three Super Bowl runs. Offensive Coordinator George Godsey was a tight ends coach for the Pats. QB Brian Hoyer was Tom Brady’s backup in New England. And of course Vince Wilfork now plays for the Texans after anchoring the line for more than a decade for the Pats. Big Vince was a key member of last season’s Super Bowl winning squad. There won’t be much the Patriots can do or show that the Texans won’t in some capacity have seen before. It comes down to matching up, winning the one-on-one battles and production. Watt Is Human After All: One of the key factors facing a Texans defense for the Patriots this week will be accounting for J.J. Watt. After a slow start where the Texans started 1-4, Watt was a big reason that the Texans turned their season around and once again leads the NFL with 13.5 sacks. Last week, facing a banged up Buffalo Bills offensive line with backups starting at both right guard and tackle, it was assumed Watt would ride roughshod over the Bills. But it didn’t happen; RT Jordan Mills making his first NFL start and backup RG Kraig Urbik both had solid games. They stuck with their assignments and the Bills utilized a running game that gained 187 yards on the ground and largely negated Watt’s effectiveness. Watt finished the game with a single tackle for a loss and just four tackles overall and at times was clearly frustrated. Jadaveon Clowney did have one of his best games of the season however with 2 TFL (tackles for loss) a sack and a pair of QB hits. Now that he’s getting healthy, he can be a disruptive influence opposite Watt. Crennel Has Defense Playing Aggressive: Part of the reason for the early season struggles was the play of the cornerbacks. Romeo Crennel had little confidence in them and they played seven to eight yards off the line and passively. Now they play Jonathan Joseph and Kevin Johnson up close to the line with Kareem Jackson in the slot. Andre Hal took over for Rahim Moore at safety and the results have been very positive. Johnson is a rookie but playing very well. By playing more aggressively, the Texans have really improved in YAC (yards after catch). They’ve gone from 24th in YAC to 12th. Those wide open passes underneath are now contested ones and they’re generating more turnovers as a result. They forced eight turnovers in the third quarter of the season after forcing just six in the first six weeks. ILBs Brian Cushing and Eddie Pleasant have been good at covering the underneath passing game. Pleasant replaces run-stuffer Benardrick McKinney on passing downs. Quentin Demps is still somewhat of a liability at times in coverage and will be a target for Tom Brady this week. He was targeted on the Bills go-ahead touchdown by Charles Clay. Texans Getting Creative Offensively: With the game on Sunday night, don’t be surprised to see O’Brien and the Texans to open up the play book against the Patriots to secure a big win and further their own playoff chances. Houston has used direct snaps, Wildcat formations, option passes to keep opposing defenses off-balance. O’Brien would love to catch Bill Belichick and Matt Patricia flat-footed for a few plays this week. They used Cecil Shorts to throw a 17-yard touchdown pass to Alfred Blue against the Jets which gave them a 17-10 lead in the fourth quarter. Speaking of Shorts, he took a big hit in the Buffalo game but is not in the concussion protocol and should be good to go for the game on Sunday night. Hoyer, Hopkins playing at a high level: Houston QB Brian Hoyer and DeAndre Hopkins have settled in nicely with the Texans under Bill O’Brien and their play has been improving as the season moves on. Hoyer spent the first three years of his career as Brady’s backup but now he’s coming into his own as the Texans battle for a playoff spot. Hoyer on the year has completed 61.2 percent of his passes for 2202 yards with 18 touchdowns and six interceptions for a 94.4 passer rating. Hopkins is becoming one of the top receiving threats in the NFL and has 86 receptions for 1169 yards, good for a 13.6 yard average and 10 touchdowns. His latest touchdown, a 19-yarder from Hoyer against the Bills on Sunday broke the franchise record set by Andre Johnson. Against the Bills on Sunday, he had 5 catches for 88 yards and a touchdown. He’ll be the guy to watch in the passing game Sunday. He’s made some incredibly acrobatic catches as his one against Cincinnati can attest. Big Vince Slowing Down: This season hasn’t been a great one for former Patriots standout NT Vince Wilfork. It seems that the big man is finally starting to slow down and hasn’t been the disruptive run stuffer he’s been in the past. Wilfork hasn’t been able to shed those double teams inside that he was so adept at for years with the Patriots and has been getting pushed back a lot inside. As a result, Houston has been playing him right over the nose at 0-technique and having him shoot one of the gaps on either side of the center. But with Vince’s lack of speed, there are big avenues available for cut-back runs inside. It is one reason the Texans have been only so-so against the run this season. It will be interesting to see if the big man gets his game elevated to the next level against his former team on Sunday night. This entry was posted in Patriots Commentary, Patriots News and tagged 2015 NFL Season, Alfred Blue, Bill Belichick, Bill O'Brien, Brian Cushing, Brian Hoyer, Cecil Shorts, DeAndre Hopkins, George Godsey, Houston Texans, J.J. Watt, Jonathan Joseph, Mike Vrabel, Quentin Demps, Romeo Crennel, Tom Brady on December 8, 2015 by Steve Balestrieri.